Are you struggling to build reliability around your American restaurant? Feel free to act through these custom 1.75 x 2 bread shaped American restaurant magnets – 20 MIL. Bread being the basic necessity of life easily appeals with most onlookers. You can hand them out on regular business days, food festivals and other times, when there is huge participation. It becomes an appreciable choice for mailing, too. This magnet can be availed for lower prices by bulk ordering. 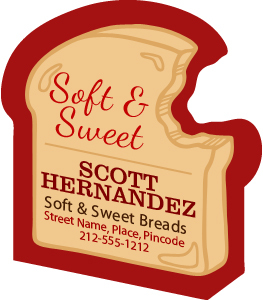 Request a quote to know discounts that can be availed for these customized 1.75 x 2 bread shaped American restaurant magnets – 20 MIL. Imprint area – 0.75 x 1 .